ANDORRA, from Philly, are self-described as “sweaty bearded boozehounds”. In fact, their song “Boozehounds” is one of their favorite to play live. This track rips with renegade guitar action. Lead singer, Kevin, has a penchant for placing emphasis on a key word or two in his vocal delivery. He sings “boooooze hound” with maturing gusto. The band’s latest release is a testament leaving the comfort of college living and moving on through the new chapters of maturity and moving on. What You Wanted, You Got” features 11 tracks with titles such as “Elephants” which includes the title of the album in the lyrics, as well “In Limbo”, “Diagnose Me” and “String me Along. 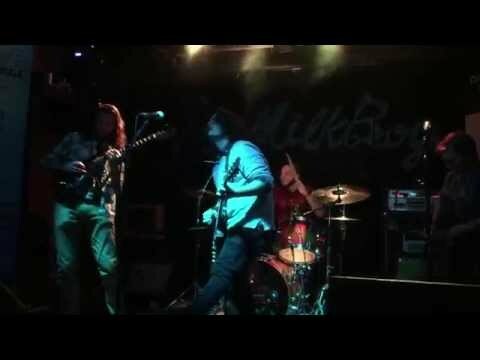 The edgy funkified opening of “Elephants” ripples with high energy and dissolves into a hard rocking alternative song. “Get me in my space/ This is what you wanted/this is what you got/Give me my space/I just need to breath”. The pounding of the drum kit twisted into the mix of the raging guitar gives this track a special pop. “Bad Habit” stands out. “You dropped me like a BAD habit”. Again the stellar, ascension of the blazing guitar popped up against the crash of the kit drive this song home. Another song that I felt exemplified their maturing sound was “String Me Along”. With its more subdued sound it takes its place as the most airy, diaphanous track on the album. Dante and Michael twist their guitar playing to move through different progressions. The song doesn’t follow a straight trajectory. Kevin’s voice goes lower when he sings “I can’t make amends with dead ends. String me along if that is easier for you”. This song moves nicely into lighter mostly acoustic track, “Brother”. The pang of love “I been loving you since I was 17/Indian Queen”. Kevin does his best la la las on this tune which presents with a bit of Weezer vibe. I definitely got into the use of the wah wah on the track “Diagnose Me”. Rolling drum beats coupled with edgy sweep of the guitar along with Kevin’s kicky vocals this is on is harmonizing infuses this song with a catchy sing a long quality A song that seems seeped in sunshiny vibes even if pleading with someone “Tell me where you were last night”? If you are a fan of 90s alt rock ala Weezer, Foo Fighters, Queens of the Stone Age, Death Cab for Cutie, and Paramore, don’t sleep on Andorra.